The Festival features award winning BBQ and incredible blues and country music. Lots of children’s activities including pony rides will be available. Visit the Taste of Redland booth and fill up on your favorite local produce and featured culinary treats from local chefs. Fruit is the unofficial food of summer, because when it’s 95 degrees out with a gazillion percent humidity, pan con lechón doesn’t sound all that appetizing. At the Redland Summer Fruit Festival, you can kick off fruit season with a host of tropical delights. The annual event showcases the best stuff that grows on South Florida’s trees. Visit the Taste of Redland tropical fruit and lychee display and fill up on your favorite local produce and featured culinary treats from local chefs with a variety of mango and lychee specialties. The entire Taste of Redland team wishes to thank you for making the Locavore Culinary Dinner & Brunch Series a great success. Be sure to check back often for special Locavore events taking place throughout the 2019/2020 season. Please join our mailing list to stay informed and receive special offers. We look forward to working with our sponsors—and welcome new sponsors—while we support a variety of community agritourism events celebrating the farms of Redland. Please contact us at info@tasteofredland.com for information about any of our Locavore culinary or agritourism programs or to inquire about hosting your event at one of our Redland locations. “I’m proud to be producing the Taste of Redland Locavore Program and bring attention to the farms of Redland. The 2018/2019 Taste of Redland Locavore Dinner/Brunch Series featured prominent Miami chefs who created exciting menus using Redland-Raised and Fresh-from-Florida seasonal selections picked fresh from our local farms just prior to each event, for a true Farm-to-Table experience. We are honored to have welcomed at each event this season spectacular live music presented by members of the South Florida Symphony Orchestra. The Taste of Redland team is grateful to all of the partners who helped produce this wonderful dinner/brunch series, including some of South Florida's finest and dedicated community leaders in the culinary and event world that have spent decades bringing needed attention to areas of Miami-Dade County just before they became some of the most revered neighborhoods. 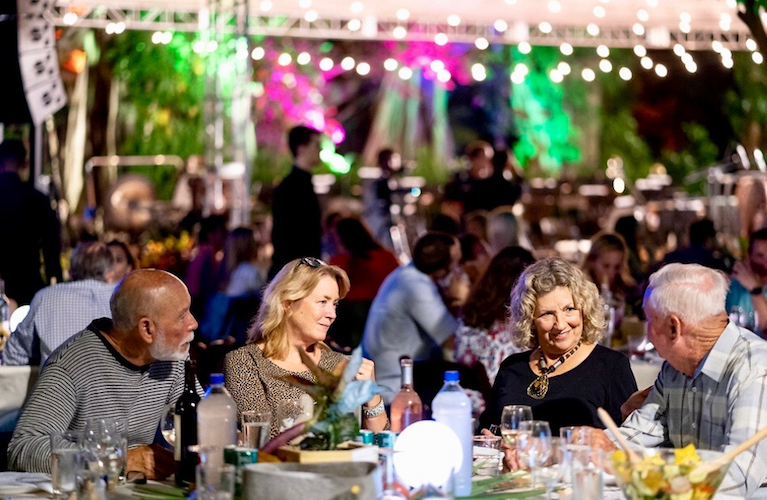 We are proud to have the dedicated help of Steve Haas, Suzanne Pallot, Louis Canales and Caron Cole as part of our team and who will continue to produce an array of locavore events designed to unite the South Florida community with the farms of Redland. Taste of Redland's mission is to celebrate the bounty of fruits and vegetables, the beauty of the farms and the amazing land in the Redland area. From cascading waterfalls to one of the world’s largest Banyan trees, the settings of our Locavore events will be memorable! Redland is full of wonderful surprises that you never imagined would be part of your South Florida journey. It is more important than ever that we support our local farming community in South Florida, so we hope you'll visit us, continue to purchase your box of fresh-picked produce delivered free with next-day delivery and get a real Taste of Redland. Join us in our effort to get the word out about the Miami Locavore Movement. We are delighted that a portion of the ticket sales throughout our 2018/2019 program benefit specific programs at Miami-Dade County’s Redland Fruit & Spice Park. 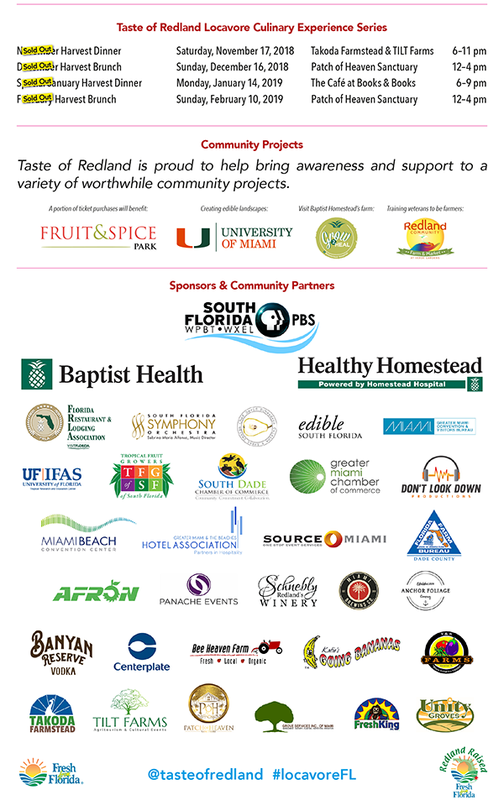 Taste of Redland’s programming will also support our outreach to The University of Miami with our donations of local fruit trees to their campus grounds, to teach students about the locavore movement and all that grows in Redland; help the plant-a-tree program at The Patch of Heaven Sanctuary, as they reforest a 5-acre tropical hammock; and bring attention to the efforts of Redland Ahead and their farms that support FIU’s Agro-ecology program to provide training to underserved populations and veterans to become farmers. Taste of Redland offers a selection of Redland Ahead’s organic and conventional products for delivery via our next-day service throughout South Florida.